The Government has failed to ensure the security of persons and property in Digana even after it was evident that a communal riot was in the making. 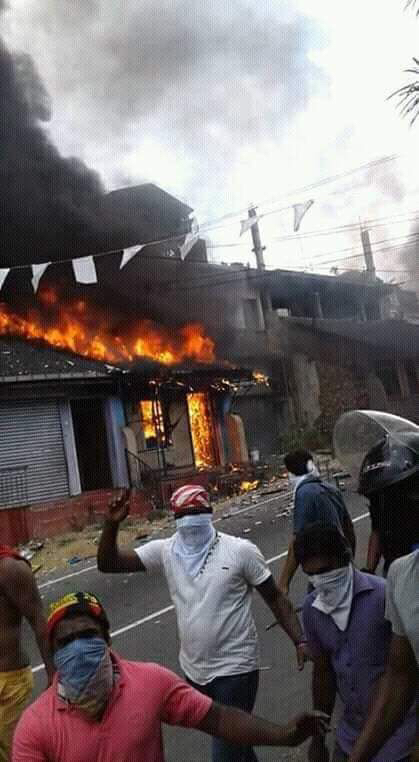 Several properties owned by Muslims as well as vehicles were attacked and set on fire in broad daylight yesterday (5th) although Police and security forces were said to have been put on alert. These attacks followed the death of a Sinhalese person who had succumbed to injuries sustained when he was attacked by a group of Muslim men. He died on Sunday night after being treated for a week at the Kandy Teaching Hospital, leading to an uneasy situation in Teldeniya, where he was resident. Colombo Telegraph is in possession of footage where mobs moved into Digana clearly with violent intent. While those who assaulted M.G. Kumarasinghe (41), a resident of Ambala in Medamahanuwara were arrested Sunday night, 24 other persons suspected of carrying out attacks on Muslims were also arrested yesterday. It is alleged that those who were apprehended had not been party to the violence unleashed in Digana. A Police curfew was imposed in the Kandy administrative district subsequently, to lapse at 6.00 am this morning (6th). Claims in social media that ‘Digana is burning’ posted at night using footage from earlier in the day have also contributed to blurring the picture of the situation on the ground. Contrary to these claims, Digana remained calm throughout last night. The Government meanwhile has been slow to respond officially and effectively to bring the situation under control. 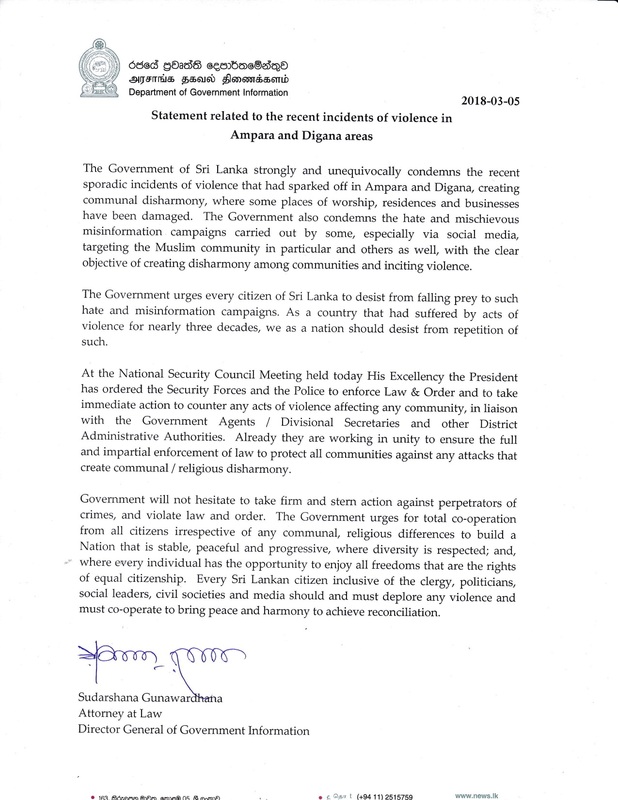 A communique from the Department of Government Information condemned ‘sporadic incidents in Digana and Ampara,’ and ‘mischievous misinformation campaigns’ but avoided direct reference and details of the violence, thereby adding grist to the rumour mills. According to sources on the ground in and around Digana there is fear among the Muslim community that there could be further attacks given this climate of vagueness and ineffectiveness on the part of the Government. No matter whose life is lost we can not bring it back. This is true fore any life ,belongs to any ethnic group.”Revenge” is a secondary process which comes after the primary action. Therefore people should always think before acting. If killing is the retaliation done for not giving room to overtake a lorry what would be the magnitude of the retaliation for an assassination? When a fire broke out it burns every thing. Also as a non-Buddhist citizen living in Kandy , I believe this incident has no racial or religious motivation involved. Unfortunately this was started by two groups who are in two ethnic groups. What I want to emphasize is, this is a result of the dilapidation of discipline and the cultural values of our society.